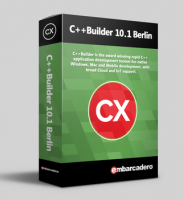 C++Builder® 10.1 Berlin Starter is a great way to get started building high-performance C++ apps for Windows. C++Builder Starter includes a streamlined IDE, code editor, integrated debugger, two-way visual designers to speed development, hundreds of visual components, and a limited commercial use license. Database components and drivers are not included.